� Keenan was ranked in the AVP's top 14 in each season except his first (31st in 2006). � Keenan has played in at least one semifinal in all 10 years playing beach volleyball. � In his first five AVP championship matches, Keenan had to face the top-seeded team each time. � In the 2014 AVP season opener Keenan won in St. Petersburg right afterwards his wife April Ross won as well, making them the third married couple to win a pro beach volleyball event on the same weekend. 2015: Keenan started the year playing with Billy Allen, with a best of fifth twice in four AVP events. Keenan then paired with Ty Tramblie, and in their first event together they went undefeated in winning the title in Chicago, including sweeping the top two seeds. Keenan was fourth in blocks per set (1.66) and seventh in hitting percentage (.434). 2014: Keenan and Mayer won the AVP season opener, knocking off three teams seeded fifth or higher. The duo had one other semifinal in their seven AVP events. Keenan ended the season fourth in aces per set (.77) and sixth in blocks (1.68). Keenan and Mayer played in one FIVB tournament, advancing from the qualifier and placing ninth. 2013: Keenan reunited with Nick Lucena for a pair of FIVB events, then played with Mayer again for two events. Keenan had a best of 17th three times in international play. On the AVP Tour Keenan and Mayer played in all seven events, with their best finish of third coming in the season finale. Keenan ended the year fifth in aces per game (.83). 2012: Keenan began a partnership with John Mayer, playing in six FIVB events together. The duo advanced to three main draws, with a best of 17th. 2011: Keenan partnered with Casey Patterson, who was making his international debut. In two of their first three FIVB events, the pair advanced from the qualifier and finished ninth. In eight tournaments the duo played in four main draws. 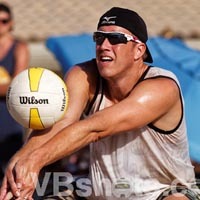 2010: Keenan began a new partnership with Casey Jennings, playing in six AVP events with a best of third. They played in 10 FIVB tournaments, with Keenan reaching his first FIVB semifinal in the Moscow Grand Slam. 2009: Began a partnership with Nick Lucena, advancing to the semifinals in their first outing. In their 13 AVP events, they made it to the semifinals six times, including four straight since returning from international play. Keenan was second in aces per game (.80) and fifth in blocks per game (1.46). On the FIVB Tour, they made the main draw in three of their five tournaments, including placing 17th in the World Championships in Stavanger. 2008: With Hyden, advanced to eight semifinals, including three championship matches, losing to top-seeded Phil Dalhausser and Todd Rogers in all three finals. He completed the season with an individual ranking of fifth. Hyden was second in kills per game (7.46), fifth in hitting percentage (.433), sixth in blocks per game (1.75) and ninth in aces per game (.52). 2007: Played the first two events with Mayer, then formed a partnership with John Hyden, advancing to the semifinals in their first outing. The duo played in six Final Fours, including the championship match in Chicago. Keenan ended the year ranked eighth in season points, and was named the AVP's Most Improved Player. He was third in kills per game (7.49), fifth in aces per game (.65) and sixth in blocks per game (1.63). 2006: Keenan began his pro beach volleyball career with John Mayer, a former collegiate teammate at Pepperdine, playing in the qualifiers in his first five tournaments. After failing to make the main draw in the first two outings, the duo placed 25th and then 17th before a record-tying performance in Hermosa Beach. The pair won three qualifier matches then proceeded to finish third, tying for the highest AVP finish by a qualifier. The high finish secured an automatic main draw berth for Keenan the rest of the season. After playing one event with Paul Baxter, he reuinted with Mayer, with a best of ninth place. Keenan, the AVP Rookie of the Year, ranked third in aces per game (.72) and eighth in blocks per game (1.61). College: Keenan was a four-time All-American at Pepperdine, being a second-team selection in 2000 and 2001 and a first-team choice in 2002 and 2003. In 2002 and 2003 he was chosen as the AVCA Player of the Year. As a senior he led the nation in blocks while also ranking among the leaders in kills and aces. Pepperdine played in the NCAA Tournament three of his four seasons, and were runner-ups in 2002. He graduated with a BS in Accounting and left the school as the record holder in career blocks and service aces. Keenan was inducted into the Pepperdine Hall of Fame in 2014. Personal: Following a shoulder injury, Keenan worked in finance before taking up the beach game. In November 2010 he married fellow pro beach player and Olympic Silver medalist April Ross.